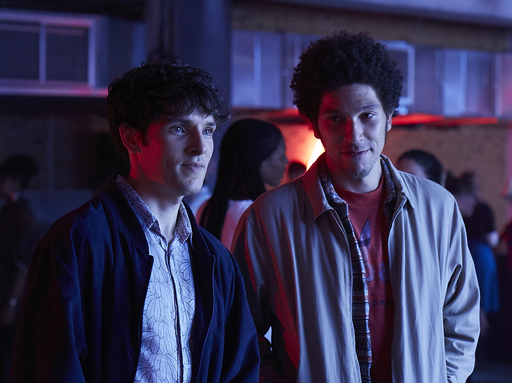 With Colin Morgan in the title role, and the likes of Joel Fry, Anna Chancellor and Jessica Raine alongside, Benjamin is a tender comedy about a writer-director facing the premiere of his second film. With its emphasis on the autobiographical and self-referential, Amstell’s work blends his own career anxieties and humour with an affecting look at masculine identity and vulnerability. Discussing these autobiographical links, Amstell sees Benjamin as a portrait of a former self, who’s now to be kept very separate from his current outlook. Like the character, Amstell also presented his work at the London Film Festival in 2018 to an audience eager to see where his creative pursuits had led, the man who has occupied a cherished spot on British television since he first appeared on Popworld almost 20 years ago. “I had to do a speech and a Q&A, and I was nervous about doing all that and I was nervous about how the film would be received for the first time,” Amstell says. The emphasis on masculinity in Benjamin and Amstell’s interest in exploring such issues of doubt and anxiety, emotional vulnerability, and self-expression was not a deliberate effort on the director’s part to tap into a current social climate. “It’s never felt to me like there’s this thing with masculinity, so I should write something about masculinity,” he says. “It’s always just come out of me, quite naturally, and I think I should just carry on like that. The only thing I have to go by in terms of whether something will be interesting, funny, authentic, is whether it’s something that I’ve felt. With this it feels like people are noticing that that’s what’s really going on, but that’s not because my process has changed, it’s just because the culture has caught up.” Our conversation is again peppered with laughter. “What I’m saying is, I’m a genius,” he jokes.